The initial purpose of a grants management system (GMS)—an automated system that tracks a grant through its entire lifecycle, as well as stores data for relationship management between the grantor and an applicant—was to store the information of submitted applications in an organized, efficient, and standard manner. Before the use of a GMS to manage a grant’s entire lifecycle, technology within a granting agency was primarily a basic, low-functioning database. Today, an administrator has the ability to manage the entire granting lifecycle, including applicant relations, panelist reviews, and fund distributions. Additionally, benefits of online storage through cloud computing and software that require less hardware have increased product capabilities. The ability for a GMS to interact with other systems, such as payment portals and accounting systems, has also made management of the grant lifecycle within a GMS easier. For many of today’s grant-making organizations, GMS is an essential tool in day-to-day activities. A total of 35 state arts agencies and one regional arts agency responded, as shown below. Among these respondents, the majority are satisfied with the ability of their current GMS to handle all four stages of the grants management lifecycle, indicating the system is meeting the basic needs of each respondent. 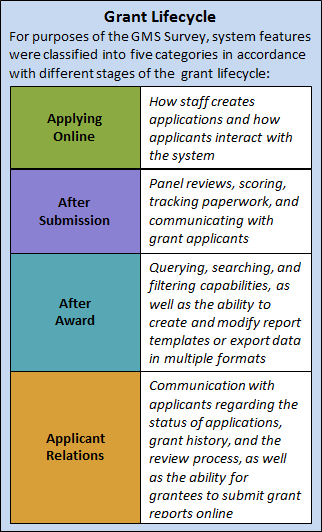 The highest level of satisfaction with GMS features among the four stages of the grants management lifecycle is After Submission, suggesting that most responding arts agencies are satisfied with the reviewing, tracking, and applicant communications capabilities of their systems. The lowest level of satisfaction with GMS features among the four stages of the grants management lifecycle is Applicant Relations, suggesting that, overall, GMS features pertaining to communication have room for improvement. To determine if the number of grants given by an agency is correlated with overall GMS satisfaction, satisfaction levels of each agency were compared with the reported number of grants given. When conducting this comparison, no significant correlations could be found, suggesting that as long as a GMS works well with the processes of the user, the amount of data pushed through the system does not appear to matter. Finally, the survey assessed reasons reported by respondents for not using GMS features. Notable is the finding that not one respondent listed lack of training as a reason for not using a feature within its GMS. Reasons for not using particular GMS features included: the feature does not fit with the established processes of the agency, feature is clumsy, or the agency has not yet been able to implement the feature in its standard processes. These three main findings disprove preconceived notions about the current use of GMS among state and regional arts agencies. In addition, the survey provides insight on the level of importance of GMS features relative to the system’s capability to do them. Summarized below, survey findings indicate that current GMS offerings are able to execute the majority of capabilities needed by respondents. GMS features (capability) by level of importance, as reported by GMS Survey respondents, 2014. Among those capabilities that respondents deem important but that are not able to be done by current GMS offerings, the majority pertain to functions needed for the "After Submission" stage of the grant lifecycle.